If you’re from New England, specifically Rhode Island, you may be familiar with coffee milk. Although I grew up in Connecticut, it wasn’t until the company Mantry recently sent me a box of goodies that I discovered the magic of coffee syrup. It’s basically coffee boiled down with pure cane sugar to make to a thick, yummy syrup full of coffee flavor. Coffee milk is simply the combination of this coffee syrup with milk, and it’s very popular in Rhode Island. Why is that little state hogging this beautiful idea?? From a very young age, I’ve always LOVED coffee ice cream – long before I was able to take a sip of joe, and I would have been obsessed with coffee milk in lieu of chocolate milk growing up had I discovered it sooner. 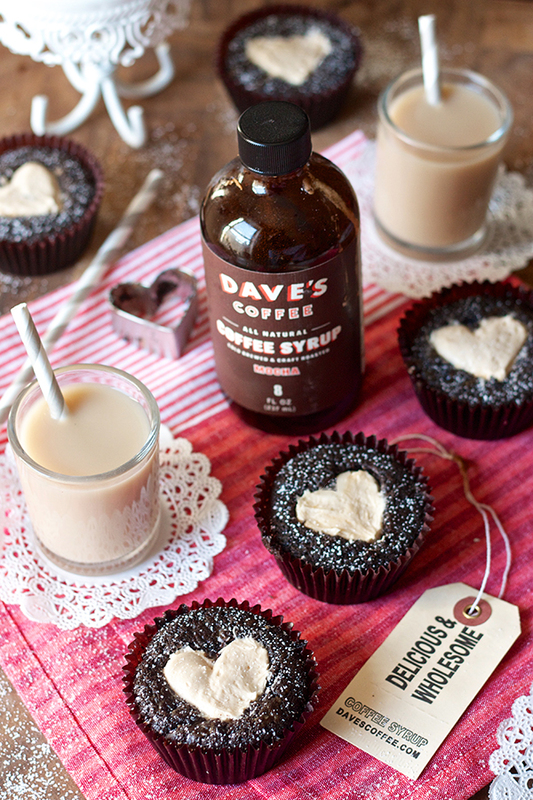 When I got a sample of Dave’s Coffee Syrup I knew immediately I was going to make frosting out of it and since Valentine’s Day is right around the corner, these cupcakes were born. Although I’m usually a huge proponent of an absurdly large swirl of frosting on top of cupcakes, I’m totally digging this new way to add buttercream inside the cupcake. I used a mini heart cookie cutter to trace out the shape (or whatever shape you want! 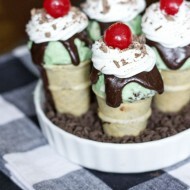 ), then used a small spoon to scoop out some cupcake and added the buttercream with a large round tip. 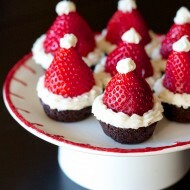 Sprinkled with powdered sugar, the results are elegant and refined without being too over-the-top. But really, the cupcake-to-frosting ratio is pretty absurd. Absurd in a beautiful way, especially when it comes to this ridiculously tasty coffee milk buttercream. Just scroll down a bit to see the photo of the insides of these cupcakes – that’s a lot of frosting and I’m not complaining! 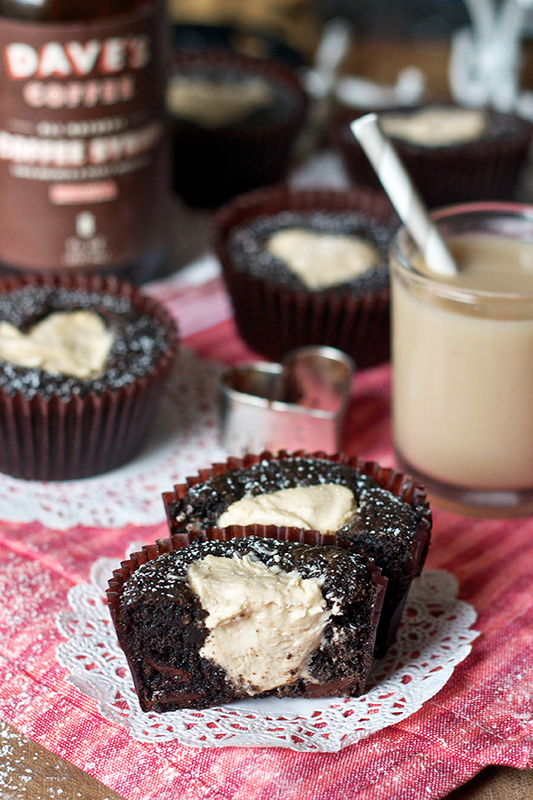 The cupcake itself is a “brownie cupcake” in that it’s somewhere in between – not just brownie batter baked in cupcake liners, but a hybrid that results in a fudgey cupcake with a bit of brownie chew. It’s an important distinction, and I lovedddd the consistency and taste of these so much! Coffee syrup may not be available in most stores, but you can go ahead and order it online or even make it at home to help flavor your frosting. 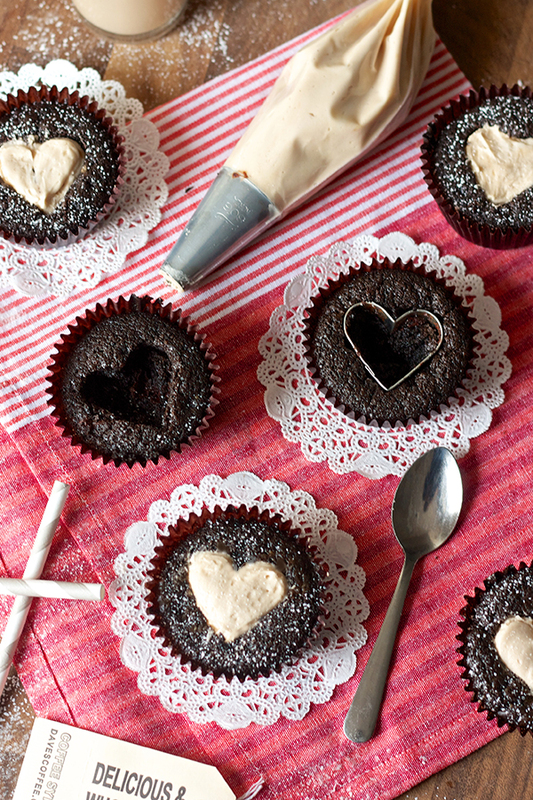 If you or your Valentine love coffee, these cupcakes will be the perfect treat to celebrate! Preheat oven to 350 degrees and line 8 muffin tins with cupcake liners. 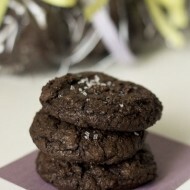 In a medium bowl, mix together the oil, butter, cocoa powder, espresso powder, and coffee syrup. Stir until smooth. In another bowl, whisk together the flour, baking powder, and salt. Set both bowls aside. In the bowl of an electric mixer, beat the eggs. Add the vanilla and sugar and beat until well combined. Add the chocolate mixture and beat until incorporated. With the mixer on low speed, slowly add the flour mixture until just combined. Gently stir in the chocolate chips with a spatula by hand. Equally distribute the batter into your prepared muffin tins, filling batter about 3/4 of the way full. 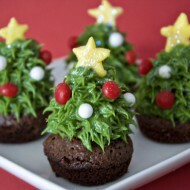 Since they're part brownie, they won't rise as much as traditional cupcakes. Bake for 10-15 minutes, or until cake tester comes out clean. Allow the cupcakes to cool in the pan for 5 minutes, then transfer to a wire rack to cool completely. In the bowl of an electric mixer, beat the butter for 2-3 minutes until light and fluffy. Reduce the speed of the mixer to medium-low and slowly add the powdered sugar. Beat for another 2 minutes until smooth. Add the coffee syrup and vanilla and beat until well combined. 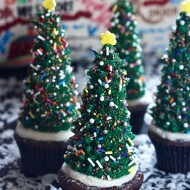 Load frosting into a piping bag with a large round tip or ziploc bag with the corner cut off. 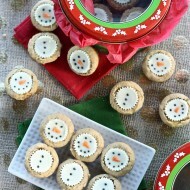 To decorate, gently press a small cookie cutter into the center of a cupcake and use a small spoon to scoop out cupcake to the depth of the cookie cutter. Remove the cookie cutter and repeat with the rest of the cupcakes. Pipe frosting into the cavities and sprinkle with powdered sugar if desired. Follow you on all media! Have you tried Haagen Dazs coffee ice cream? 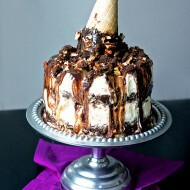 I love it on top of chocolate pecan pie! I can’t wait to try this recipe! Coffee ice cream is my jam!! I follow you all over the place. 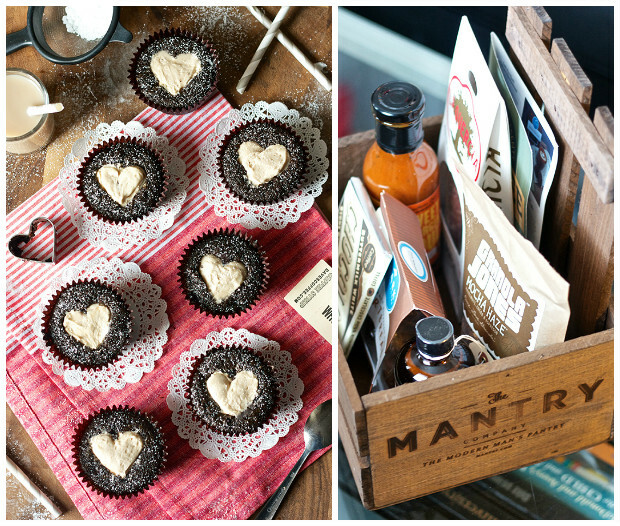 :) And I have one man in my household that would love a box of mantry items just for him! 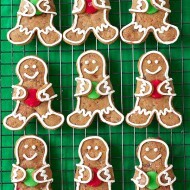 I’m a FB fan! I bet my hubby would love Mantry. I had completely forgotten about coffee syrup. And I’d never thought to use it in cooking. Brilliant! Sounds amazing! 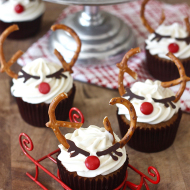 The cupcakes are adorable!! Thanks for the daily entry! me again with my fingers tightly crossed! !